A scorecard from the Action Max manual, which mentions the unreleased game and the planned fall 1987 release date. This is the strongest evidence of the game's development. The Action Max was a game console produced by the California-based toy company Worlds of Wonder in 1987. At the time, videogame developers wanted to integrate full-motion video (FMV) into their games. However, game cartridge memory was insufficient to hold the video data. One solution from the time was to use Laserdiscs, as seen in the 1983 arcade game Dragon's Lair. However, due to the high cost of Laserdisc, it was not seen as the best method to bring these games into the home. Also, digital video compression onto CDs was not yet sufficiently advanced enough to hold the video data. Therefore, Worlds of Wonder chose the VHS format to hold the FMV component of their games. After all, VCRs were common in homes at the time, and the tapes were much cheaper to produce than Laserdiscs. All of the games utilized a light gun, with the player shooting flashing targets that appeared over certain objects on the screen. There was also a suction cup sensor that attached to the screen which watched a flashing light in the bottom right corner. The purpose of this light was to tell the console whether the object on screen was an enemy, which would result in the player gaining points for shooting them, or an ally, which would result in the player losing points for shooting them. As VHS could only play from beginning to end, the game is the same every time, with the goal remaining to collect as many points as possible. Worlds of Wonder produced five games for their system. They are Blue Thunder, Hydrosub:2021, Sonic Fury , .38 Ambush Alley, and The Rescue of Pops Ghostly. All five of the officially released games have had their video data preserved. Due to simple nature of the Action Max, the video files can be played from a hard drive, DVD-R, or a home-recorded VHS tape. As long as the data is sent to a CRT, the console is able to interpret the games the same as using the original tapes. Additionally, the Daphne-Singe project interprets the original video data and allows the games to be fully playable on a computer by clicking targets with a mouse. 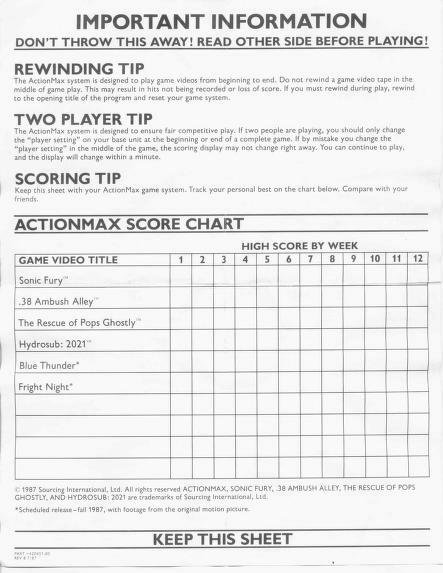 However, the instruction manual for the Action Max contains a scorecard for players to keep track of their progress. This scorecard mentions a sixth game that never saw a release. Fright Night is mentioned alongside Blue Thunder in the Action Max manual as being planned for a Fall 1987 release. However, while Blue Thunder did receive a limited release, Fright Night seemingly vanished. Both games are stated to contain "footage from the original motion picture". Because Blue Thunder used footage from the 1983 action-thriller movie of the same name, it is safe to assume that Fright Night would have used footage from the 1985 horror film of the same name. Worlds of Wonder never released screenshots or box art for the game, though the box art would have followed the same style of the five released games. Worlds of Wonder was hit hard by the October 1987 stock market crash and finally folded in 1990. No prototype content or further information has surfaced since. Official boxart for the five officially released games.